I’d like to tell you about one of my most recent coaching clients, Bella. After 6 years of trying, Bella’s faith in miracles was restored when she conceived just two months after saying YES to actively transforming her mindset about her fertility. Hers is an IVF success story, and I think you’ll find it inspiring! From a medical perspective, Bella and her husband were far from ideal candidates for IVF. Bella had low ovarian reserve, poor egg quality, and adenomyosis. Her husband had low sperm motility and morphology. 3 years ago they decided to try their first IVF. She started looking for ways to heal both her body and soul. That search led her to me. Through our work, she realized that she had unresolved issues around two abortions she’d had when she was much younger. We healed her spirit and she made peace with her past and continued trying to conceive naturally. That was in 2014. But when Bella decided to try IVF again 2 years later, it didn’t work. When she called me this past November, Bella told me she’d all but given up. Her mother had persuaded her to try one more IVF, but it was a last-ditch attempt, just to satisfy her mom. She had little confidence that it would actually work. So she asked me if I thought I could help her. I said that if she was just going through the motions, the IVF was likely to fail. If she wanted the outcome to be different, she needed to create different circumstances, too. And so, just 2 months ago, Bella said YES to my support. Before and during her final IVF, Bella and I focused on healing her adenomyosis, visualizing her eggs abundant and healthy and restoring her belief that this final IVF could and would work. And the initial results? She had 2 first grade embryos (never-before achieved). Then in our final session (before her transfer), I guided her to embrace her “mother energy,” taking the unconditional love she’d always felt from her mother and channelling it toward her own future child. This specific meditation was the turning point for Bella, because it made becoming a mother real for her. Equipped with her Body Prayer + 4 weeks of support calls that included many powerful visualizations, 3 SOS calls later Bella felt ready for her IVF, regardless of the outcome. 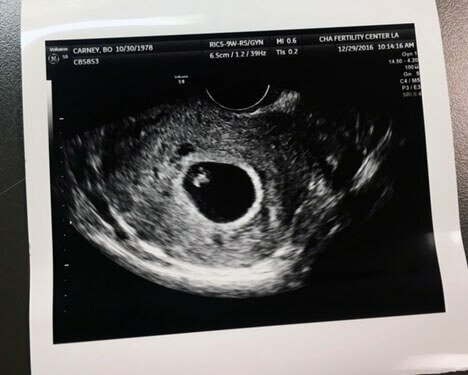 At the beginning of January, Bella sent me a beautiful thank-you email with her 7-week ultrasound attached. If you have an IVF coming up soon and you want some additional support, click here to find out more about working with me 1 on 1 and how to apply. It’s free to apply, and you’re in no way obligated to enroll! P.S. Read more inspiring success stories HERE!